Since 2010, China has spent roughly eight percent of GDP on infrastructure, which is way more than the four percent average of the next ten biggest spenders. This gap is unproblematic if construction is unusually productive in China, contributing more to the country’s future growth capacity than other sectors. The Chinese government’s recent record on directing investment spending is poor, however, and acknowledging the resultant bad debts would roughly halve China’s recent growth rates. In the case of construction in particular, the government seems to be getting it wrong. In order to keep employment high, China has long used the construction sector to absorb excess labor. Over-hiring has opened up a large gap between the size of the construction workforce and its economic output. 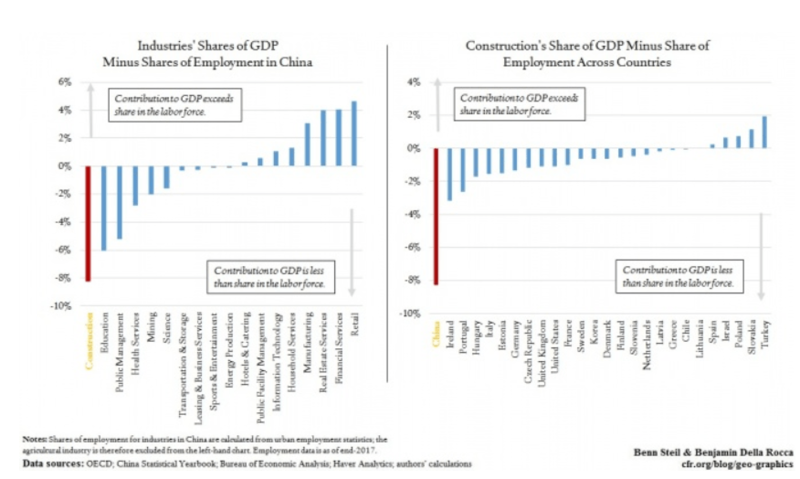 As the left-hand graphic above shows, construction’s contribution to China’s GDP is a massive eight percentage points lower than its share in the overall labor force. Construction, therefore, appears to be far and away China’s least productive sector. This fact suggests that China pouring new stimulus money into construction is misguided. And indeed, an international comparison supports this view. 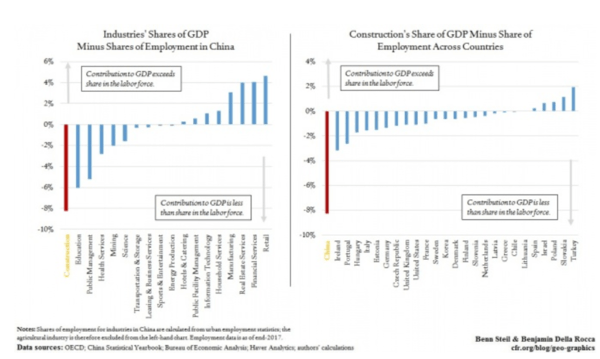 As the right-hand graphic shows, China’s employment-output gap in the construction sector is vastly larger than that of any OECD country. In short, the Chinese leadership is betting the house on infrastructure spending at a time when the return on such investment is perhaps the lowest in the world, and the lowest it’s ever been China. It’s a bad bet.